We formed the Bighorn Sheep Disease Research Consortium in 2009 to bring an interdisciplinary approach to the puzzle of bighorn pneumonia. Pneumonia has been killing bighorn sheep since settlers first brought domestic sheep to graze in bighorn habitat. Although the link between bighorn sheep pneumonia and domestic sheep is well known, little headway has been made in controlling, or even understanding, this disease. The Consortium brings together specialists from many fields to share their expertise: disease ecologists, microbiologists, wildlife biologists, veterinarians, parasitologists, modelers, landscape ecologists, and science communicators. The Consortium members work at a variety of institutions, and each person brings unique insight to the challenges of understanding this complex disease. Thomas Besser’s research focuses on the epidemiology and ecology of infectious diseases caused by pathogens transmitted across host species. He is on faculty at the Washington Animal Disease Diagnostic Laboratory where he has worked since 1990. Dr. Besser directs the graduate program in Immunology and Infectious Diseases. Frances Cassirer is a wildlife research biologist for the Idaho Department of Fish and Game. She has been coordinating bighorn sheep research in Hells Canyon since 1996. Paul Cross is a quantitative disease ecologist who enjoys working on applied conservation problems. He lives in Bozeman, Montana. Brett G. Dickson is President and Chief Scientist for the non-profit research collective Conservation Science Partners, and an Assistant Professor and Co-Director of the Lab of Landscape Ecology and Conservation Biology at Northern Arizona University. His interests include advanced spatial analysis using GIS and remote sensing, statistical ecology, and wildlife-habitat relationships modeling. Andrew Dobson's research focuses on the ecology of infectious diseases in a variety of fragile ecosystems. He works in the Serengeti, in East Africa, in the United States and in several South East Asian nations and is a professor of Ecology and Evolutionary Biology at Princeton University. Peter Hudson is the Director of the Huck Institutes of the Life Sciences, and the Willaman Professor of Biology at Penn State University. His research focuses on wildlife-disease ecology, including zoonoses. Kezia Manlove is a statistician and infectious disease ecologist living in Bozeman, MT. Her work on the bighorn project explores interactions between pathogen persistence and population demography, and the role of social and spatial structure in shaping transmission patterns during lamb disease outbreaks. Raina Plowright is Assistant Professor of Epidemiology at Montana State University in Bozeman, MT. She is an infectious disease ecologist and a veterinarian. Raina's research focuses on persistence and spread of infectious diseases in wildlife populations, the conditions that lead to spillover of pathogens into novel species, and the conservation impacts of diseases on wildlife populations. Shane Talley is a field technician stationed out of Enterprise, Oregon. 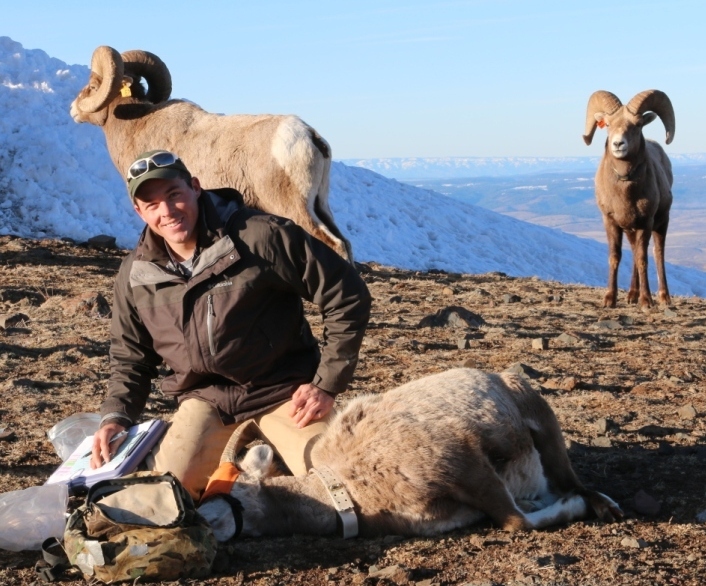 He previously worked with bighorn sheep in Nevada and Montana. His work has focused on disease and pathogen carriage and transmission. Logan Weyand is a biological aide stationed out of Lewiston, Idaho. Logan is also a full time student at Washington State University. Carrie Lowe is an assistant district biologist for the Washington Department of Fish and Wildlife. We are grateful to The New York Community Trust for funding an earlier study looking at disease and climate change; some of this work helped lead to the work of the Bighorn Sheep Disease Research Consortium. The Morris Animal Foundation provided the support that catalyzed our research and the formation of the Bighorn Sheep Disease Research Consortium. MAF funded both our initial proposal, in 2009, and renewed our funding in 2011. As a result, we have been able to conduct two detailed field studies, data analysis, and disseminate our findings through multiple outlets, including this website. Consortium members have presented results at meetings and conferences, through published papers, and elsewhere. Dissemination of both our finding and methods is an important focus of the Consortium and we are grateful to MAF for supporting this aim as well as the work itself. This foundation has provided funds to support our field study in the Wallowa mountains of Oregon.